Excited to share we now have a public library instance of TeachingBooks.net for our patrons to use. It is a childrens & young adult content resource and worth exploring for program & display ideas and for assisting kids with reading assignments/book reports. It requires library card authentication. Use this section to find additional resources for Young Adults and links to external websites and recommended reading lists. Click here or Chidren. We are excited to share we now offer access to TeachingBooks.net for our parents, teachers, and young people. Use your Mono County library card to log in and find information on children's and young adult titles, authors, program ideas, as well as information for reading assignments and book reports. KidsReads - Info about favorite books, series and authors. Reviews of the newest titles, interviews with the coolest authors and special features on great books. Use this section to find additional resources for Children and links to external websites and recommended reading lists. Click Here for Young Adults. ABCMouse - Early Learning Resource you can use at the library for free, or sign up for at home account (monthly subscription cost). Raising A Reader- Our early literacy outreach program for pre-school age children. Children's Choices Chosen by kids themselves! In order to make Storytime a happy, learning time for all, we encourage parents to use this opportunity to teach children listening and cooperative skills. Be attentive and participate in the program; help your child get the most from the sessions. Visit with friends after storytime is over. We do not expect silent, rapt attention, however, if your child wanders or becomes too restless, please leave the room with him/her so that others can enjoy the stories. Remind your children to use their inside, library voices after the program. Please teach your child that books are to be valued and treated with respect. After storytime, be an active listener as your child shares the stories and activities they heard in storytime. If your child is particularly interested in a book that was read at storytime, we suggest you check it out to read at home. Institutional and home-based day care providers are welcome to involve their children in storytimes! The Mammoth Lakes Library would be happy to arrange Special Storytimes, at 10 am on Wednesdays, to accommodate larger (15+) groups of children. Please provide at least two weeks notice for this service. If you would like to request storytime visits to your daycare or preschool, please contact Raising A Reader coordinator Kacee Mahler at 760 934-4777. 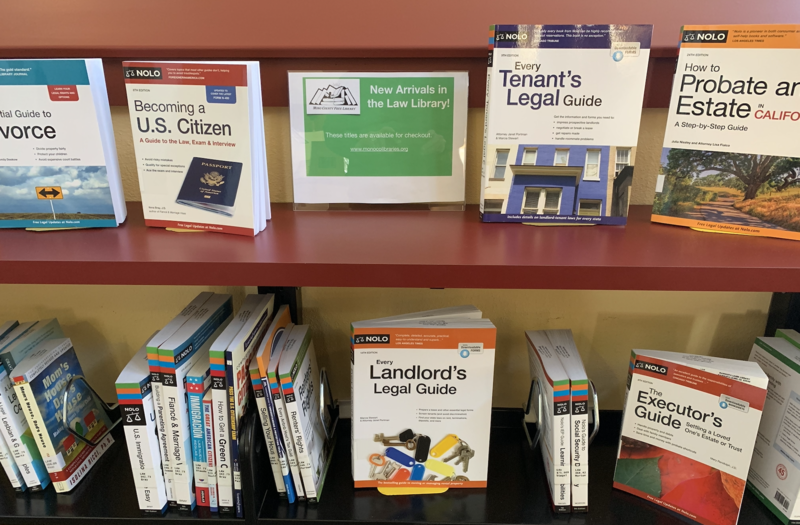 The Law Library Collections in the Mammoth Lakes and Bridgeport public libraries contain materials for use by the public, for free, to assist in researching common legal questions or issues. Many of the materials are available to check out with your Mono County library card. Library staff can help you locate and navigate materials and refer you to additional legal resources and experts. Library staff cannot provide legal advice or comments on specific scenarios or laws. The nearest California Tribal Court is the Bishop Paiute Tribal Court. Additional information about common legal topics, the California court system, and programs administered by the California Judicial Branch can be found on the California Courts website, including additional Self-Help categories in English and Spanish, and free online legal forms, many available in Spanish. The State Bar of California provides many resources for the public, including lawyer referral services, legal resources relating to immigration, and information for finding free legal help.